Sealing your crawl space can solve moisture problems and improve the comfort and health in your home. 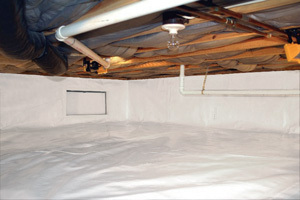 If you have a damp crawl space, the problems caused by moisture can extend to your upstairs living space. Mold, pests and musty air can affect your indoor air quality and damaged insulation can have a negative impact on your comfort. 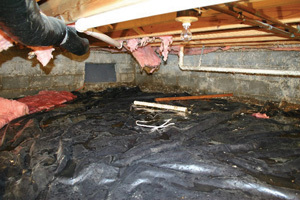 Comfenergy offers crawl space encapsulation and repair solutions to help prevent these problems and keep your crawl space dry. If you need help repairing your damp crawl space, know that we are a local contractor in Northern VA with the experience and products to do the job right. For a free estimate on crawl space repair, call us at 1-855-764-5297 or click below! This crawl space has mold problems and damaged insulation caused by excess moisture. Encapsulating the crawl space creates a barrier between the crawl space and outside, helping keep the crawl space dry and keep out pests. Why repair your crawl space? 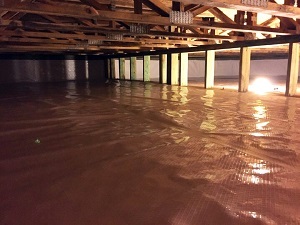 Crawl space encapsulation is an effective method for controlling moisture and preventing expensive repairs. By sealing your crawl space you can improve the air quality in your home and potentially lower your heating and cooling costs. Encapsulation can help prevent serious structural problems caused by rotted beams and floor joists. An encapsulated crawl space also gives you valuable storage space! If you're experiencing any of these issues, contact us today to schedule an on-site evaluation and estimate and let one of our professonal crawl space contractors assess the condition of your crawl space and recommend the best solution for your home. We offer a variety of crawl space products and solutions, including vapor barriers, insulation, structural repair and more. 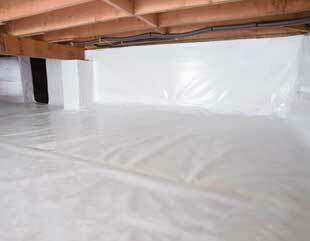 The crawl space encapsulation system that we use has helped thousands of homes and includes a written warranty. If you need help sealing, insulating or repairing your crawl space, contact the experts at Comfenergy today! We will provide you with a no-obligation estimate for the cost of your crawl space repair project. We'll also send you a copy of our full-color Crawl Space Science Book. Our book includes 88 pages of information on crawl space issues, how they're solved, and what our products can do for you. Call or e-mail us today to get started!